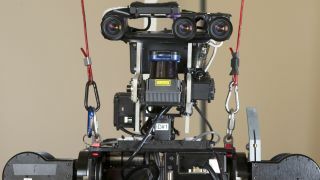 A South Korean robot named DRC-Hubo has won the Darpa Robotics Challenge, beating 22 competitors on an obstacle course that simulated a disaster scenario. Robots had to complete a series of tasks - climbing steps, driving a car, getting out of it, opening a door, drilling a hole in a wall, turning a valve and crossing rubble. A mystery task was also added - on day one it was pulling a level, and on day two it was a plug that had to be removed from one socket and inserted into another. The bots had to perform untethered, and plenty fell over catastrophically. But Tartan Rescue's Chimp bot managed to get back up again without human help, and eventually came third, winning its creators $500,000. The time limit was one hour, but DRC-Hubo completed the course in just 44 minutes and 28 seconds, taking the $2 million grand prize. Second place went to IHMC Robotics, who won $1 million. The competition was run by the US Department of Defense's Darpa research unit, which aims to create new military technologies. A team from Google had been favourite to win, but quit the contest before it began - allegedly over concerns of being linked to a military-backed event. Now that's settled, here's a compilation video of some of the robots falling over.